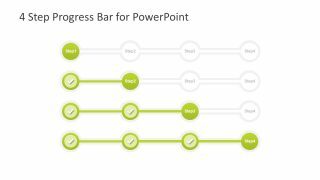 The 4 Step Progress Bar Design for PowerPoint is a workflow template with a simple pattern of business activities. It has rows and columns to illustrate the systematic progress of organizational processes. For example, planning the key performance indicators, schedule, cost and resource management tasks. Further, the 4 steps of progress bar design help create an idea of achieving milestones one by one. The users can make an interesting transformation diagram presentation using this color transition template. 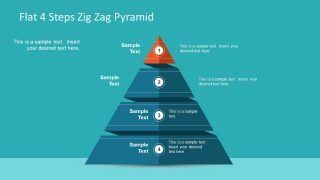 The PowerPoint diagram of 4 step progress bars contains four horizontal timeline patterns in a slide. These horizontal bars have green circular icons which portrays the desire growth. Whereas, the transparent path and circular milestones demonstrate incomplete sections in given tasks. 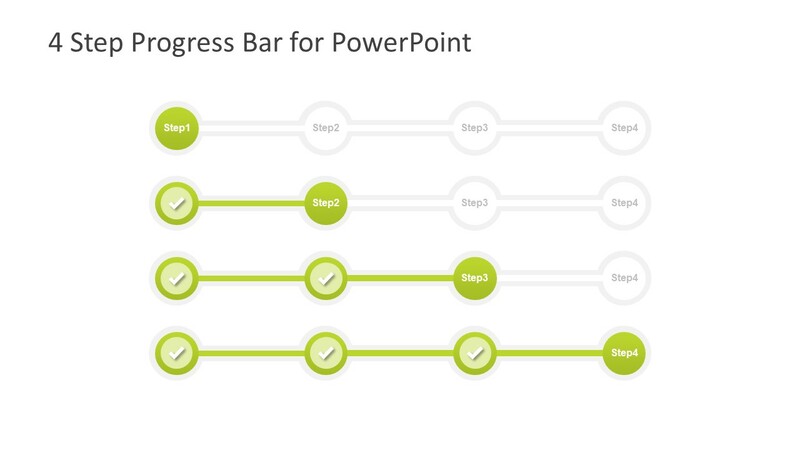 This 4 Step Progress Bar Design for PowerPoint assist audience to understand the workflow diagram. 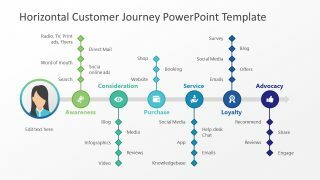 The timeline path with editable shapes of PowerPoint explains the process within an organization. 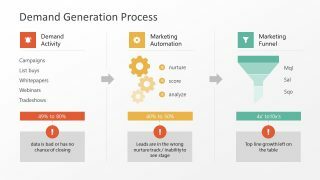 Therefore, the template is useful in demonstrating business or project progress, sequence of steps defining a workflow. The easy to edit PowerPoint of progress bar design has two background versions i.e. white and black. This feature enables users to select a diagram based on the color theme of main presentation. 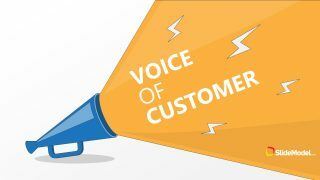 Additionally, the users can choose a desire PowerPoint background color, picture or use the effects to enhance the visuals. For instance, click the format background button in design menu bar. The toolbar will appear on the right sides with number of simple yet useful options. 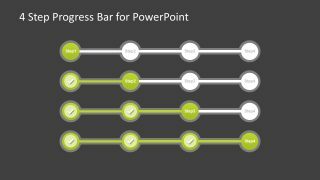 The PowerPoint diagram of 4 step progress bar is a creative business template design to explain growth and development. It is a single slide template with circular shapes of connecting processes as milestones within a timeline diagram. The space inside the circular shapes has text placeholders to enter task description or add titles. The diagram of 4 stem progress bar design depicts the progress options such as, business, management and marketing.